Photos by Mike Moore | The Journal Gazette A Morilee Peta bridal dress is on display at Wendy's Bridal on Coliseum Boulevard. 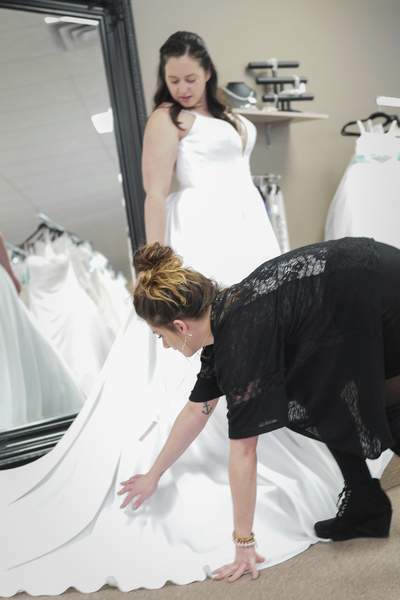 Wendy’s Bridal store manager Chantel Longfield helps Emily Otter with her dress. Couples are thinking outside the box for their weddings. 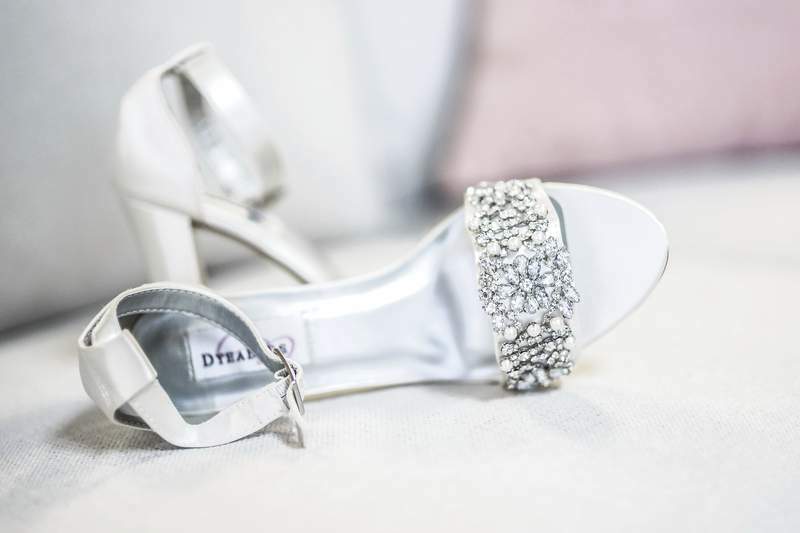 2019 Bridal Extravaganza: Noon to 4 p.m. Feb. 24 at Grand Wayne Convention Center, 120 W. Jefferson Blvd. Admission is $12 advance, $15 at the door; tickets available at fortwayne.com. Sponsored by Fort Wayne Newspapers and Fort Wayne Magazine's Weddings. Northeast Indiana Premier Bridal Spectacular: 1 to 4 p.m. Feb. 17 at Honeywell Center in Wabash. Tickets are $5. This year's weddings are all about creating an event to remember. Couples are thinking outside the box and incorporating ideas that not only show off who they are but involve the guests from the save-the-date invitation to the final exit. One of the first wedding planning steps for couples, especially the bride, is choosing a dress. Tesia Lapp, owner of Wendy's Bridal at 507 Coliseum Blvd. 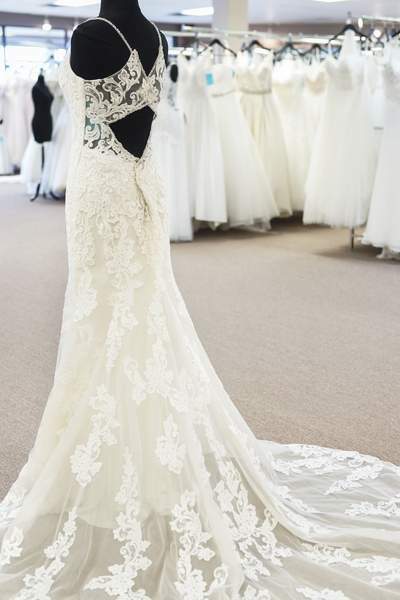 E., says many brides are seeking dresses that are non-traditional. Lapp is seeing many brides choosing dresses that have a boho feel; however, Lapp is still seeing a lot of lace and tulle skirts as well. Satin is making a comeback and brides are choosing satin gowns with a clean line, she says. Another trend is brides are allowing their bridesmaids to wear different dresses in the same color. “It looks really great in photographs,” Lapp says. Some of the more popular colors are slate blue and brighter pinks, such as rose, Lapp says. By letting bridesmaids choose their own dresses, it “allows bridesmaids to be in a style that's comfortable for them,” she says. When it comes to the wedding itself, more couples are looking to fall to exchange their vows. “Fall weddings are all the rage,” says Rachel Evans, co-owner of Sweet Events Wedding and Event Planning on Lake Avenue. Although wedding season starts about May, Evans says late September and October are the huge booking season. Baby blue, ruby and wine reds with blush accents are colors more couples are using in their ceremony, Evans says. And what about the food? Taco bars will be feeding guests. And while many couples are planning actual wedding events, Evans, who also officiates weddings, has seen a lot of couples choosing to elope instead. She says many will elope and then plan a reception later for family and friends to celebrate. Which could be cheaper for many couples, as Evans says the Midwest bride spends an average of $5,000 to $10,000 on a wedding.